I’m not one to be super critical of products and companies on this blog and I’m going to put as positive a spin on it as I possibly can. But I ran into something recently that was quite a wake-up call for me and I’m going to share this with you. It used to be that if you were vegetarian or macrobiotic or into eating whole grains, rice cakes were the standby snack food. Plain, slathered with peanut butter or apple butter, or perhaps with hummus, rice cakes made an extremely innocent little snack that didn’t harm anything or anybody. 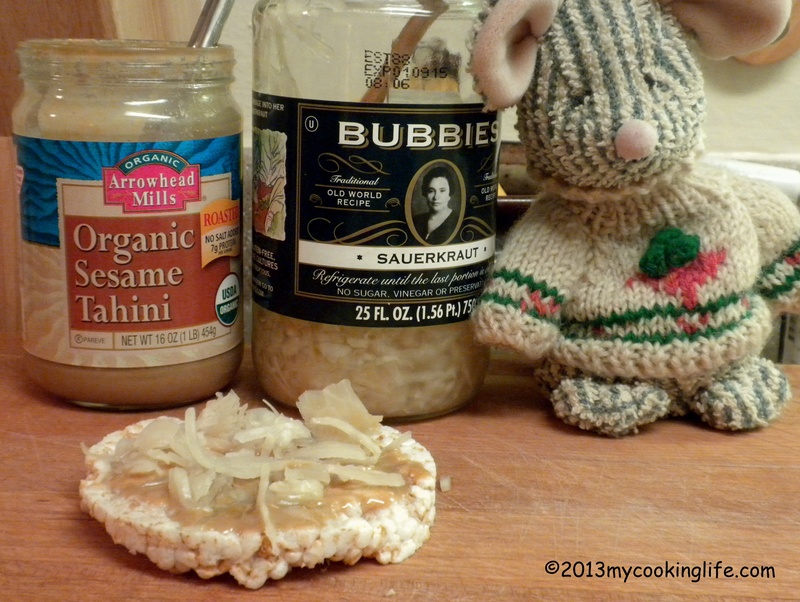 Claude loves rice cakes with toasted sesame tahini and sauerkraut. Moi aussi, Claude, me too! Today there are many brands of rice cakes. Most notably in my supermarket I see Quaker brand. That makes sense, doesn’t it? Aren’t they the oatmeal people? Rice cakes have been a natural expansion of their product line for years. Fine. They are an industrial food manufacturer, very mainstream and it is not surprising to find that several of their rice cakes have sugar and a bunch of other stuff that I wouldn’t feed to a dog. No surprise there. I also bought their rice cakes. My favorite is the Mochi Sweet Rice but I also like several of the others. These make very substantial snacks. In fact, the bags are surprisingly heavy because, as the company brags, they are made with twice as much rice as other brands. And sure, I know that “caramel” and “cinnamon toast” rice cakes and some others are likely to have sugar in them and I never bought those. The problem is, I used to be able to pick my flavor of rice cake and just toss it into my cart. I didn’t have to give it a second thought. These were Lundberg’s after all. I could count on them to be high quality, fine products. 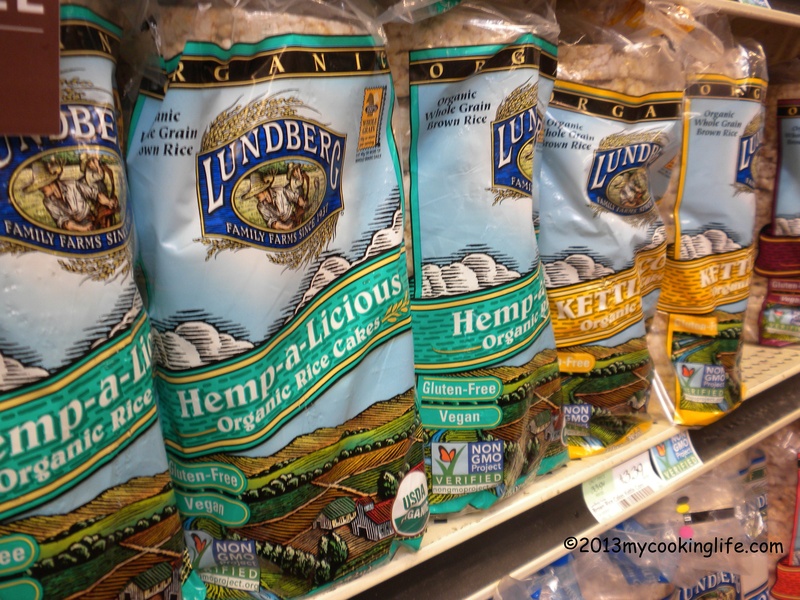 A couple of weeks ago I was shopping and I saw two flavors of Lundberg Rice Cakes that were new to me: Organic Hemp-a-licious and Organic koku seaweed. I picked the sea weed one because I have been conscienciously adding more sea vegetables to my diet lately. The Lundberg line-up at Whole Foods Market. How come. HOW COME? Hello! . . . Because they have cane sugar in them! If this doesn’t shock you, believe me I understand. The quality of food in our so-called healthy foods stores is rapidly spiralling in the wrong direction. I read food labels no matter where I’m shopping. I just didn’t think I had to read this one on the Lundberg Rice Cakes. But I sure should have. I threw the seaweed rice cakes out. Actually, seaweed can help your body get rid of things like excess dairy and can help you re-balance your body when you have been eating sugar. BUT NOT IF THERE IS SUGAR RIGHT THERE IN IT! Cane sugar in seaweed rice cakes! Are you kidding me? Eldon and Harlan Lundberg must be rolling in their graves! There are also some flavors that still do not have any cane syrup in them, but they are in the minority these days down on ol’ Lundberg Farms. I’m disappointed in the Lundbergs, no doubt about it. But I am also going to continue to buy their excellent products that I consider worth eating like their organic rice, their organic brown rice syrup and their rice cakes that don’t have sugar in them. Ultimately, I can do without the rice cake and stick with the whole grain brown rice. After all, Lundberg Farms has played a very big role in promoting organic, sustainable farming and they still do. They have done as much for the expansion of the natural food industry as most any other company. They take a stand against GMO’s and I applaud them for that. Perhaps they figure a little sugar in some of the rice cakes to keep the bottom line from crashing is a price worth paying in order to continue holding the line against powerful enemies like Monsanto. Well I don’t agree. Tell the Lundberg boys they are sliding down a slippery slope—the slope that places profit over quality. But actually, WHO is sliding down that slope? Is it Lundberg Farms? Or is it us? Would it be a good idea to boycott this company for putting cane syrup in their rice cakes? Or would it be better to not buy those particular products and continue buying their fine, organic, sugarless, rice products? Should we “pick our battles” as they say? Or have we underestimated the hold the sugar industry has on us and our economy? You tell me. I, for one, will continue to vote with my dollars. But it is a tricky business. I go in my Whole Foods store and week after week they have discontinued items I bought regularly and they have filled the shelf space with new products, many of which I will never buy because of what’s in them. They do this because these products are “what sell,” explains the Customer Service representative. I get it. There’s only so much space on the shelf and they have got to move their inventory and make a profit. I wouldn’t want a company like Lundberg Farms or Whole Foods to go out of business. Then where would we be? I have been putting in more time to shop at the smaller health food chains and a local co-op that often have some of those hard-to-find products and I try to find time to go to local grower’s markets when they’re open. My voting dollar has a little more power in these smaller arenas, I feel. But I do have the ability to do more than vote with my dollar and so do you! I also “vote” with my voice, my blog and any other appropriate communication channel. I talk to someone at Whole Foods customer service frequently. I tell them what the problem is and sometimes they bring something back onto the shelf that is of far better quality than what they had. Sometimes I talk to other shoppers. Most of them are in there because they do want to eat healthier food and they simply don’t know their way around yet. I’ve helped a few and have learned a lot myself from doing that. At the end of the day, I don’t know how much difference my actions will make. But that doesn’t mean I won’t keep trying. Been doing this since my childhood days as a member of the United Farm Workers Union. I am putting my shoulders to the wheel with a lot of other individuals who have already made a big difference and we are going to just keep going! The question I first asked was, Can We Effectively ‘Vote with Our Dollars?’ Yes, if enough of us get busy telling the story so we have lots of votes. And, I am going to write a letter to those wayward Lundberg brothers. 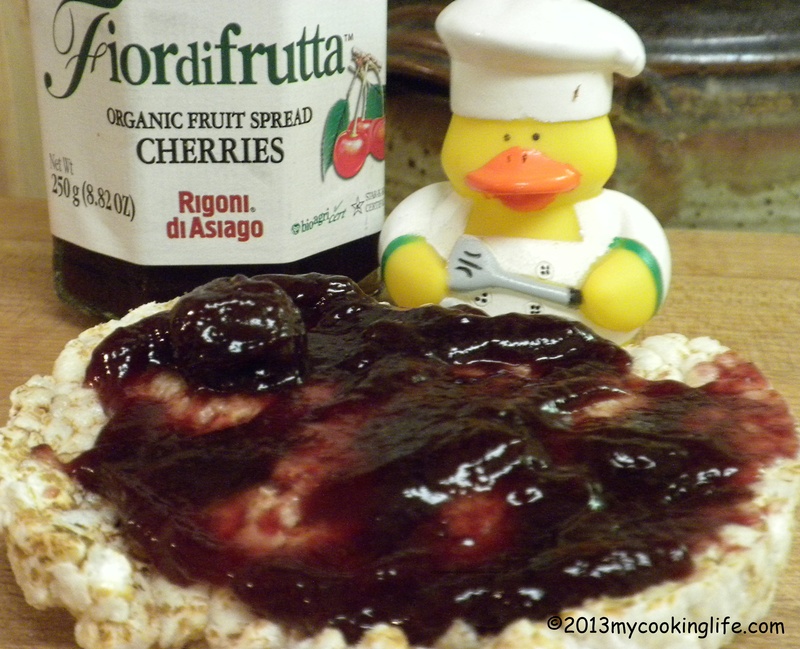 Lars prefers yummy jam on his rice cakes. Mmm, Cherry jam is a good choice, Lars! This entry was posted in Health, Ingredients, Sugar and tagged healthy food, Lundberg Farms, Monsanto, read the ingredients label, Sugar, Whole foods by mycookinglifebypatty. Bookmark the permalink. Really? Lundbergs? This is true! Gosh, I guess we have to keep reading the labels of EVERYTHING, don’t we? Sigh… My daughter actually just sent me (I said I would eat them) a few rice cakes with chocolate on them. Her company got them free. I ate the three she sent, but surely wouldn’t buy these. Guess even our rice cakes aren’t safe any more! It is disappointing for sure. But maybe some smart people will realize there is a market for truly healthy food and start a chain of “real health food stores.” The latest trend I see is mailorder organic food and even produce. In the meantime, they know me well at customer service in my WF store!! !